blared the Wall Street Journal headline this morning. As usual, not only is that not the whole story, it’s misleading. It’s wrong. It’s dumb. It raises the question of why the mainstream media adamantly refuses to report the facts. More importantly, why do they ignore the blatantly obvious implications of the actual data? The answer must be that they don’t want us to know. Because it’s ugly. First, this figure is based not on the actual dollar figure, but on a seasonally adjusted figment of statisticians’ imaginations based on an arbitrary, multiple smoothed and filtered moving average that purports to represent what the number would be if it were not for those pesky seasonal swings. This number will be subject to multiple revisions in the months and years ahead until it most accurately fits the actual data. It is an abstraction which, as of the date of the initial release, may or may not come close to reality, and we have no way of knowing whether it does or not, other than to look at the actual data. So why not look at just the actual data, plot it on a chart, and see how it’s doing that way? That’s exactly what we do. The second problem, aside from seasonal finagling, is that the number is nominal. It does not include the impact of inflation. To get an accurate view of the volume of orders, it’s necessary to adjust for that, which is simple enough to do by applying the Producer Price Index to the current and historical nominal data. 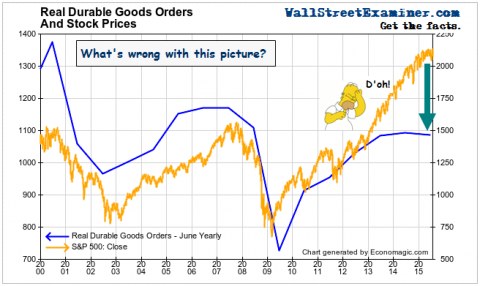 On that basis real durable goods orders rose 16.9% month to month in June. Yes, that’s a whopping, world-beating number. June is usually up. Last year June was up 10.9% and in 2013 it was up 8.3%. Why so much this year? Because May stank. It was down -3.7%, which was far worse than any May over that 10 year period. May is usually an up month. 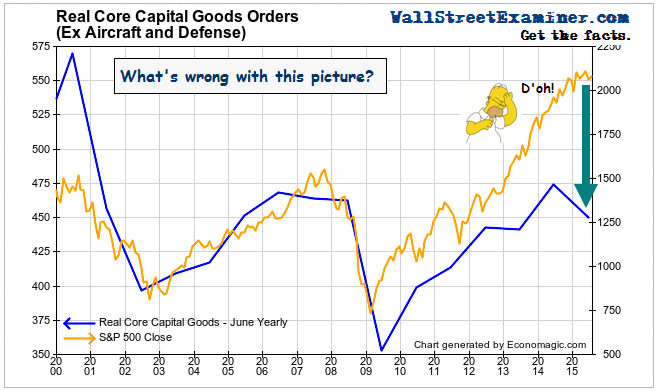 The June gain was simply a matter of delayed orders from May catching up. The total gain of the 2 months was +13.2%. That was still pretty good compared to years past. In 2014, the total gain for the 2 months was +10.6%. In 2013 it was +15.9%, which was the best uptick for that 2 months since 2005. The problem is with the year to year trend. It was down -0.7%. This was the third straight down month, and the fourth in the last 5. That sounds like a trend. This is not something new. That trend is part of a long term theme. Against it, the stock market bubble sticks out like a sore thumb. As the Wall Street Journal accurately points out, durable goods orders can be whipped around crazily from month to month by things like airplanes and aircraft carriers. You would have to sell a load of refrigerators to equal one aircraft carrier order. Not that anyone manufactures refrigerators in the US, but you get the gist. The Journal said Boeing sold a ton of planes at the Paris Air Show. So the Journal and all the other mainstream outlets back out orders for defense and transportation goods to come up with what they call “core capital goods” orders. This is a pure measure of business investment. They said that after transportation orders were backed out, the monthly increase was just 0.8%, failing to mention that after inflation, that’s a negative. Looking at the actual volume of orders after inflation, June was up 13.4%, which again is a big number boosted by delayed sales from May, which also had an unusual month to month decline in this data. The two months had a net gain of +11.1%. That was less than last year’s May-June total gain of +14.2%. It was about in the middle of the range for those 2 months for the past 10 years. It just wasn’t good enough to reverse a weakening trend. The problem is in the trend. Without those big ticket transportation goods, annual growth is even worse than the trend including those items. The year to year change was a decline of -5.2%. That was the 6th straight monthly drop on a year to year basis, and it was the biggest drop yet in that string. Apparently business owners prefer to buy stocks than to purchase capital goods to invest in their businesses.